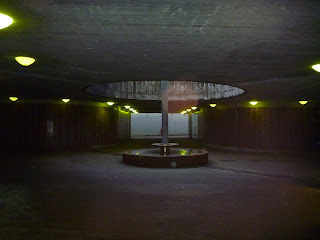 I found this strange place in Stavanger not too long ago. Lying just up the hill from the train station, it's a sort of underground crossroads and not exactly a classical beauty. However, with the daylight flowing in from a circular hole in the ceiling, dark corners, strange yellow-greenish lamps and the sound of running water from the fountain and the underground brook, it has a very special atmosphere, and is definitely worth checking if you're in the neighbourhood.